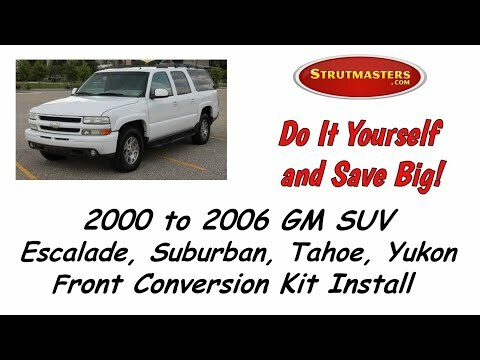 End your air suspension woes for good with this Strutmasters 2007-2013 GMC Yukon 1500 4 Wheel Suspension Conversion Kit. For less than the cost of replacing one of your OEM struts, you can convert your entire Yukon to sturdy, dependable coils with a Limited Lifetime Warranty. 2007-2013 GMC Yukon And Yukon XL 1500 4 Wheel Air Suspension Conversion Kit With Light Fix Module (GC24FM) is the perfect solution to your air suspension problems. Designed to be very affordable, you can convert your air suspension to use standard. Simply put, the cost difference between choosing an active vs. a passive suspension system is huge! It's what convinces most of our satisfied customers to make the switch when their air and electronic suspension system has failed. The air and electronic suspensions are made up of a bunch of delicate components that are easily degraded by road conditions. Yukon owners often find that once the system starts to fail it means recurring trips to the dealer and thousands of dollars in repairs. By making the switch to a passive suspension you are replacing those delicate parts with strong steel components and maintaining a safe, comfortable ride for you and your family. We invented the conversion kit to save ourselves and customers like you time, frustration, and money. Don't take our word for it, read the reviews from customers who have made the switch. Our kit, for your 2007-2013 GMC Yukon & Yukon XL 1500, includes one suspension control module to eliminate the warning light, two Eibach coil springs and two shocks for the rear, and two pre-assembled coilover struts with Eibach springs. The kit is a direct replacement, which means no modifications are needed, and it delivers convenience without sacrificing ride quality. 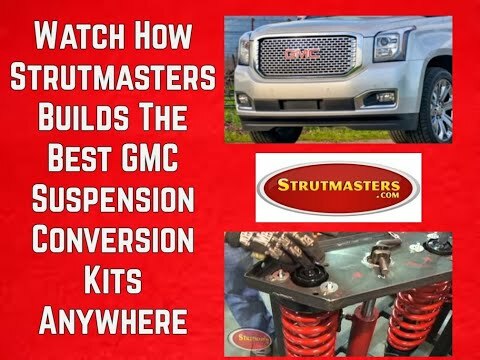 The suspension conversion kit eliminates dependence on complicated air parts for good- never worry about bringing it to the GMC dealership for repair again. 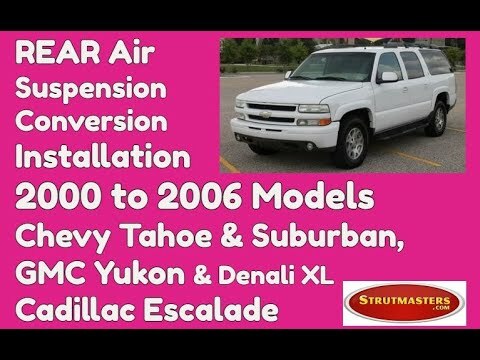 How Do I know If My Yukon 1500, Yukon XL 1500 Air Suspension is failing? Are you noticing the loud hum of your compressor running more and more? Is your Yukon sagging in the rear especially under load when it didn‚Äôt before? Sounds like you might have a leak in your air suspension system. 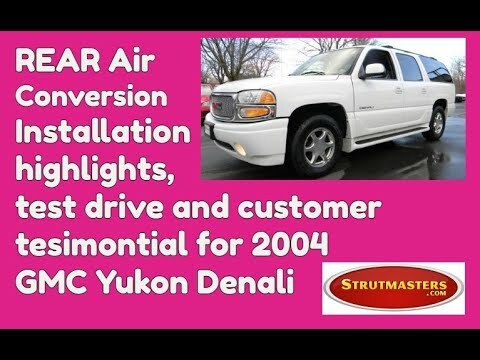 Problems with the air and electronic suspension on your 2007-2013 Yukon or Yukon XL 1500 can quickly become costly, so if you suspect a problem you‚Äôll want to get it checked ASAP before a small problem like a leak in an air line becomes a total suspension failure costing you thousands. The Yukon is known for compressor failure which may or may not be as simple as a blown fuse, so you‚Äôll want to check that first. If your Yukon is unable to maintain its proper ride height it‚Äôs a clear indication you have developed a leak in your air suspension system. Diagnosing a bad suspension quickly could save you thousands, however the factory suspension system is delicate and it‚Äôs not unusual to continually have to replace components, especially after 80k miles. If you‚Äôre noticing any symptoms of a failure in your suspension you‚Äôll want to be sure to get it repaired quickly as a failing suspension makes your vehicle unsafe to drive and could leave you stranded. 2007-2013 GMC Yukon & XL 1500 Air Shocks (x2)- The GMC Yukon features two electronically-controlled air shocks which use air bladders rather than standard coils to dampen, or even out, the ride. 2007-2013 GMC Yukon & XL 1500 Coil Springs (x4)- These coil springs work on the same principles as those found in a passive suspension. However, they are designed specifically for your Yukon‚Äôs stock suspension and will need to be replaced should you decide to convert to a passive suspension. 2007-2013 GMC Yukon & XL 1500 Electronic Struts- These adjustable electronic struts are controlled by electrical charges sent by the suspension control module. They control the comfort of the ride using a gas-charged hydraulic fluid and metal particles. 2007-2013 GMC Yukon & XL 1500 Air Lines- These plastic hoses bring pressurized air generated by the compressor into the air springs. This air allows the air springs to inflate to the proper height and pressure. 2007-2013 GMC Yukon & XL 1500 Solenoids (x4)- The solenoids on your Yukon are responsible for regulating the air pressure in each of its air spring. They are connect your Yukon‚Äôs electrical and mechanical components to its suspension control module. They will begin to leak as they get older, which will put an extra load on other components such as the compressor and cause them to deteriorate more quickly. 2007-2013 GMC Yukon & XL 1500 Compressor- The air used to inflate the air springs in your Yukon is generated in the compressor before being pumped into the air bags via the air lines. It is often the most difficult and expensive component in an air suspension to replace or repair. 2007-2013 GMC Yukon & XL 1500 Dryer Assembly- Moisture causes a great deal of damage to an air suspension system from the inside out, most often by freezing and cracking. To combat this, your Yukon features a mechanical dryer which removes moisture from the system. Most experienced mechanics advice that you replace this component whenever the compressor is replaced. 2007-2013 GMC Yukon & XL 1500 Suspension Control Module- Your GMC has a special suspension computer that uses signals sent from the height sensors to determine how much each air spring needs to be lowered or raised. It then sends signals to the rest of the system to keep the vehicle at its proper ride height. 2007-2013 GMC Yukon & XL 1500 O-rings- The air suspension system in your Yukon uses rubber washers to keep the air lines sealed where they connect. Proper seals ensure that the system stays efficient and free of debris. They should be replaced whenever possible.